My best friend had a crush. She was in love. We thought they were going to get married. But she just found out that he’s dating another girl. 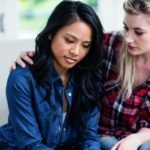 How can I help my best friend to cope? Posted 25 October 2017 under Ask Us. It’s so great of you to want to help your friend. Most crushes and relationships during the teen years are a great way to learn about how to have relationships, how to figure out who is a good person to be involved with and how to deal with feelings when it doesn’t work out. It can be very upsetting and disappointing when the person you like or love doesn’t return your feelings. You can help by being a good friend, continuing to talk about and do the things you normally do together, and listening to her if she wants to talk about her feelings about this. If you think her sadness is going on for too long (more than several weeks) or she is too sad to do her usual things (go to school, see her friends, eat and sleep normally), please seek help from an adult such as a parent, trusted adult or school guidance counselor. My bf and I broke up recently. He has a new girlfriend now but I am still so in love with him. I told him how I felt and he said he still loved me but he wanted to be with his girlfriend and since has been asking me for relationship advice. I feel so heartbroken and disrespected but I don’t know what to do.